I am one of those people who like to have something sweet for breakfast. Not sugar sweet of course, but you know, banana pancakes, sugar free granola and fruits, Kaiserschmarrn, all sorts of pies, millet porridge with banana, etc. (by the way, you can find recipes for all of the above already on my blog). But from time to time I feel like having something savory for breakfast. Mostly, such desire ends up in me making scrambled eggs. So yesterday I decided I want to find a savory alternative to scrambled eggs that still contained lots of protein and would give me enough energy to get through the morning session of studying. I found the idea for today’s breakfast here, gave it a little twist in my mind and came up with this recipe. I knew I already had all the ingredients in the fridge and I even have the ramekins. The only problem was that now I had to wait until morning to make it. 1. Preheat the oven to 210 degrees Celsius. 2. Slice the toast in half diagonally and place it in a medium pan over medium heat. Keep checking up on it and turn it when grilled enough on one side. I did not use any grease but feel free to melt some butter before adding in the bread. 3. Take two small ramekins (8,5 cm diameter) and place one heaping teaspoon of sour cream in each. 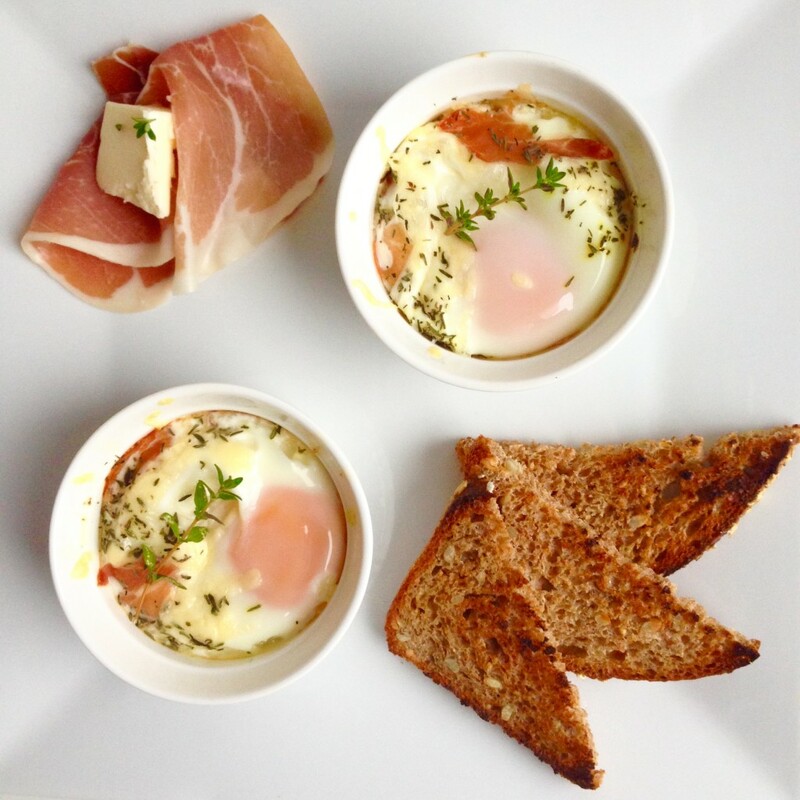 Tear one slice prosciutto into small pieces and distribute half into both ramekins. Grate as much gouda cheese as you like over it. 4. 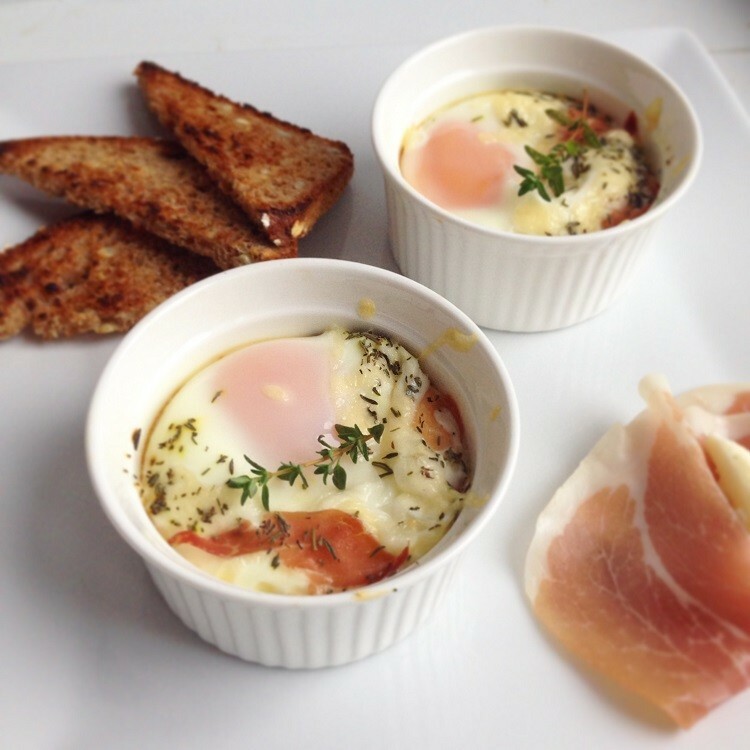 Place one egg into each ramekin, season with salt and thyme, add remaining half of the first prosciutto slice and grate more gouda on top. 5. Place both ramekins in the preheated oven and bake for 10 – 12 minutes, until the egg whites have set. Serve with grilled toast and more prosciutto.